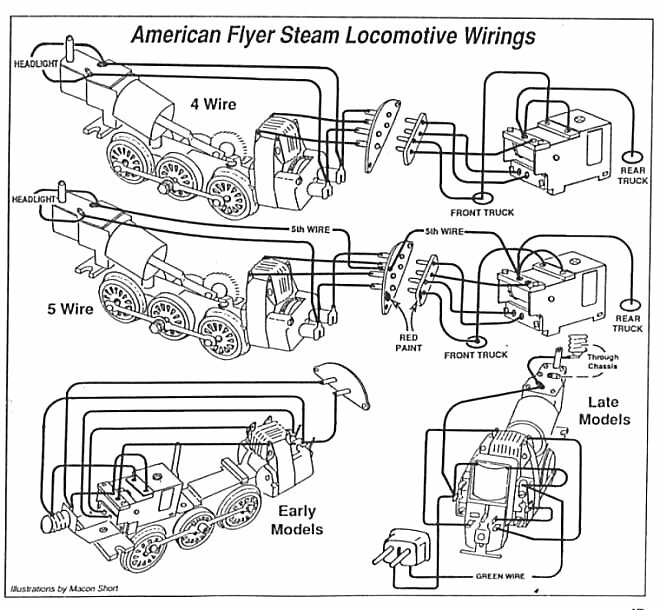 Roy - you don't specify which Flyer loco you need the wring diagram for - but if you look here at Chuck Harrington's terrific site, you'll find most of them. Some of them are a bit inscrutable, but if you go back and forth between the real e-unit and the drawing, it should be clear. Not to be nerdy nor Mr. Know-it-all, but American Flyer uses Reverse Units, lion** uses E-units. I know, it's an almost universally used name, but it's still not correct! The prewar units use a slightly different finger setup, I don't know what else might be different too. The postwar ones use the same fingers and the main difference between the boiler ones and the tender ones (we are talking about the common 4-step unit, and not the 4-step unit used in the cab of the 0-8-0 engines nor the later 2-step reverse unit) is the mounting lugs and the lockout lever, drums pawls, fingers are all identical in the post-war versions, AFAIK. Tell me something new just need any wire diagram. That's a great diagram Carl! shows all the "common" variations--although not noted, sometimes the plug wires are inverted (different workers on the line? ).